That one tiny piece of glass allowed me to open my heart, it gave me the strength I needed to put myself out there and to look for someone new. My friends helped me compose a profile and soon I received responses. Most were lackluster or endless email chains. I am to old for games so endless emails are not my style. In essence I am wise beyond my years, my heart is sacred and I deserve the cream of the crop. Except the cream didn’t respond to my profile. Online sites were getting old, duds filled up my inbox, and speed dating was fun, but I never came up with a winner. Hope, I was losing it and slowly retreated back into my solitude. That is until one day a Marine emailed me in actual sentences and paragraphs. I wrote back, my two sentence responses led to paragraphs, the paragraphs led to text messages, and soon he would be sitting across from me at Burger Jones. That first date was only the beginning. To his surprise I asked to see him again and then again. Soon my birthday was upon us and he met my family for the first time. My parents eagerly awaited his arrival and welcomed him into the fold. We had lunch at The Bronks in Lake City, picked out a pumpkin at Pepin Heights, and like always found ourselves drawn to the water. This was to be the last nice day of the year and I wanted to go for a walk on the beach. I found a few pieces of glass, my Mom she brought me a few more and so did my sister. The Marine quickly noticed that everyone was helping me and he to took up the search while skipping rocks. 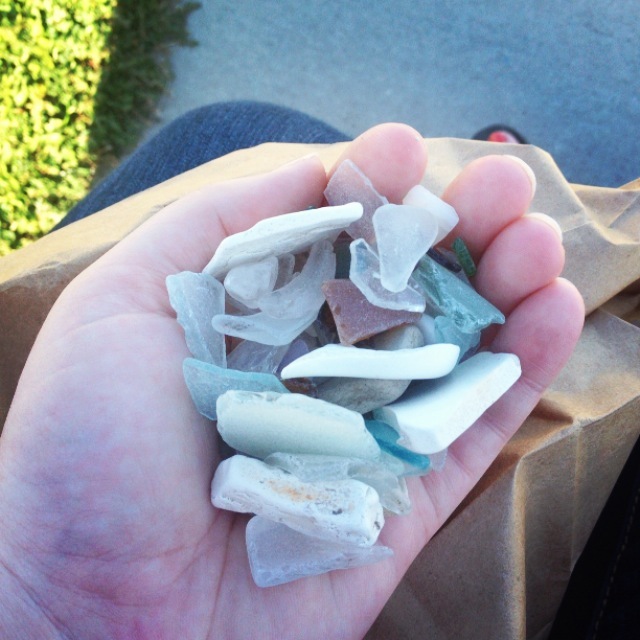 As my hands grew full I explained that when Charlie was alive we would search the beach for his precious sea glass. Of how I spent my summer looking for glass to fill the half empty jar Charlie left behind. That night when I arrived home I put my spoils into a new jar, to my surprise it was filled to the brim. I snapped a photo and fired of a text proclaiming a success. The Marine’s response caught me off guard “Next summer we’ll have to fill an even bigger jar!” He doesn’t know it, but with those words read I became a teary eyed mess and in that moment I knew I was finally brave enough to let someone new into my life.